Australian LARK (Library Applied Research Kollektive), a grass-roots group connecting professionals and academics with interest in practice-based research, celebrated its fifth birthday last month. Having a professional network of people with similar interests may sound quite straightforward, but there are days when I think it’s a miracle that baby LARK reached childhood by the human measure and, probably, teenage years by measure of longevity of a grass-root group. With LARK, bird jokes and metaphors are inevitable. We sometimes talk about being birds of the feather. Since C-EBLIP belongs to the same bird species, I’d like to share LARK’s story, a bit of parental pride, and some insights from our five-years long flight. In 2011, I made an unusual job change and, after many years of working at universities, I started working in an independent high school. In 2012, I initiated a research project at work and thought that some collaboration would go a long way in boosting the study. I also felt a strange sense of isolation in this new sector although connections with information worlds in which I worked before seemed obvious. So, I decided to call professionals from different corners of the library, information, and educational sectors to come to an informal meeting called Let’s talk about research. We gathered after work at St.Vincent’s College (Sydney), had a nibble and a glass of wine, talked about research interests, and had a good time. People were enthusiastic about establishing a network and thought we needed to put in place some structures to support our connections. That’s how LARK was born. My library colleagues at St.Vincent’s College and I decided about the name, I started the blog and a mailing list and invited people to join us. The mailing list had a decent number of members pretty quickly. We were ready to fly. But, we didn’t. Any baby needs a fair bit of attention. Baby LARK needed attention and lots of patience. It kept quiet and slept a lot. Like most first-time parents, I had some misplaced expectations based on examples I saw (Humanist Discussion Group being the prime example). Where I expected chatter and collaboration, the LARK list offered a deafening silence. My messages to the list felt like sending letters to myself. So, I’d let my daily life take over and LARK slide far to the periphery of my (and everyone else’s) attention. But, whenever that happened, there was someone sending a private message saying how much they enjoyed posts about research. Or, my interpretation of the enthusiasm at the first meeting as one-off occurrence would be corrected by people who’d get in touch to ask when we were meeting next. So, LARK met again. And again. Some people continued from the first meeting (notably, Alycia Bailey), others joined in for a short or long period of time. Some have become regular companions (shout out to Janet Chelliah and Bhuva Narayan from the University of Technology, Sydney – UTS). We usually had around 15, sometimes 20 people in engaging meetings after work, always followed by dinner. Our colleagues were getting in touch afterwards to say how they’d like to join, but couldn’t on that occasion. During the first couple of years, I expected people would either come in bigger numbers or stop coming altogether. Neither happened. Academics, librarians from university, public, school and special libraries, information professionals, and teachers kept getting together. The gatherings had never been large, but the group thrived nevertheless. With ongoing activities and a need for some support, we joined ALIA (Australian Library and Information Association) in December 2013. What also happened over time was that people were getting in touch from various parts of Australia to say how they had research interests, but felt isolated and disconnected from research networks. This is how we initiated regular online events in 2016. Our first online event included presenters from Australia and New Zealand. Like face-to-face meetings, online events attracted a solid audience, but not a huge following. They became, however, an important connection point. The most recent webinar in 2017 was also an opportunity to reach out to other professional groups who talked to us about their research experiences reinforcing a sense of interprofessional connection. LARK’s online presence grew in other ways too. 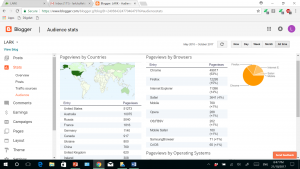 The collaboratively written blog has attracted a fair bit of attention over time. Particularly important were contributions from the ALIA Research Advisory Committee. C-EBLIP’s own Virginia Wilson has become a contributor, too. 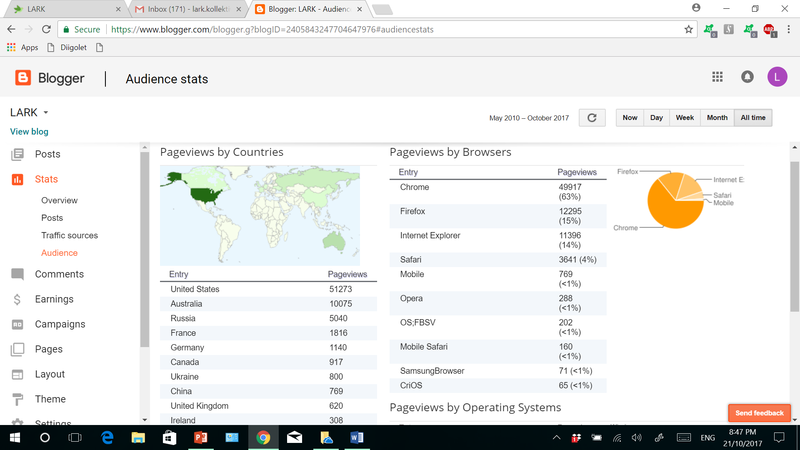 According to the latest statistics, LARK’s blog attracted over 79200 visits from around the world, well over 700 visits per post. During a period of a couple of years, Fiona McDonald, Liz Walkley Hall, and I ran the first Antipodean LIS reading group on Twitter (#EBLIPRG). We connected with professional groups overseas and even had a session facilitated from Ireland. LARK had an important role in making #EBLIPRG visible. In May 2017, LARK branched out from online spaces and Sydney to South Australia. 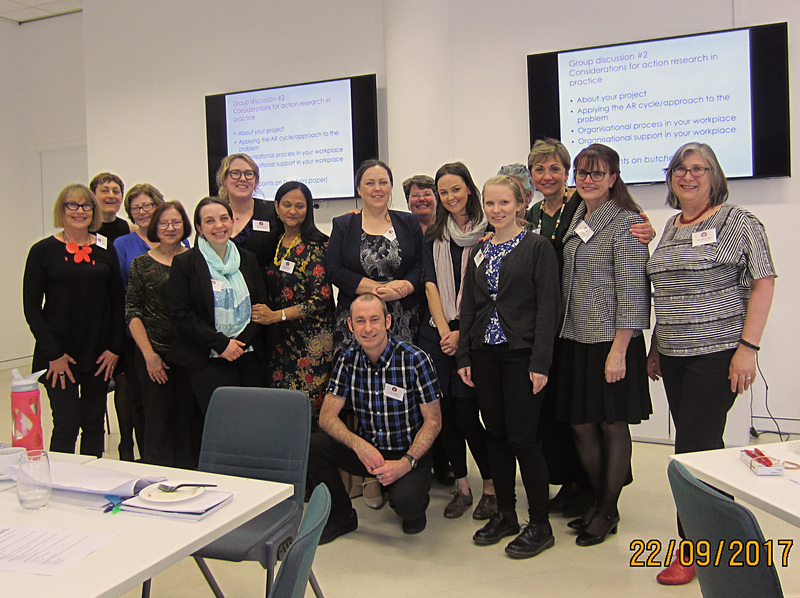 Liz Walkley Hall had already led an active research group at Flinders University and decided to initiate LARK group in South Australia to connect with colleagues from other organisations. The group had an initial meeting and has plans for future events. Post by post, event by event, LARK has become very visible in the Australian LIS landscape. In September this year we celebrated LARK’s fifth birthday in a research style by organising a seminar titled Holy Evidence! Research in information practice. Yet again, it was a relatively small gathering, but one for which some people traveled significant distances. It was also pleasing that LARK was able for the first time to offer a grant to a LIS student to attend the seminar (congratulations to Crystal Campbell, a student at UTS). In the first half of the day, we considered the Australian research landscape and heard from a variety of experienced researchers and novices from different sectors and even industries. In the second part of the day, we had a workshop to discuss how to develop a research project from idea to reality, and how to publish research findings. A feeling of connection and genuine engagement in the room was well supported by feedback forms. People greatly enjoyed not only substantial learning, but also each other’s company. It was particularly rewarding to see that people who came from afar were not disappointed. A sense of a connected research community was palpable in the air. During the seminar, I looked back at the five years of LARK and thought of many dispersed people who are prepared to put effort in making research a reality in LIS practice. Establishing connections between interested people is essential, especially when they don’t even see themselves as researchers. For research you only need curiosity and tenacity; everything else can be learnt, said David Schmidt at the LARK’s seminar when he talked about research capacity building in health in rural and remote areas. With a network of curious tenacious people, learning is much more likely to happen, and it’s also much more enjoyable. A network also makes practice-based research visible. Another issue is the formation of research bubbles along academic and professional, hierarchical and sector-based divisions. Distinctions between different types of research and interests are real, but often grossly exaggerated. When it comes to research, there are more connections than non-negotiable barriers. With LARK’s participants and presenters from various LIS sectors and allied fields, it has become evident that we have a lot in common when it comes to sharing research experiences and concerns. Groups like LARK open the lines of conversation and help us pop the bubbles. In the spirit of interprofessional learning, I looked up what biology says on how birds of the feather flock together. They are known for changing direction, possibly to confuse predators. The change can be led by any bird in the flock and others will follow. How birds of a feather flock together…they are democratic claims an article in the Daily Mail interpreting a research study. Without looking into the authenticity of this interpretation, I like the idea that any bird can take a leadership position when it picks up important signals from its place in the environment. I like to believe that this is how a loosely organised group like LARK thrives. People come to the group for a short or long period of time, but they keep up the flight and influence the direction. At the end of the seminar, a few young librarians from various parts of Australia offered their help and expressed their willingness to be more involved with LARK. After a very rewarding research celebration, these offers were a real highlight for me. They are saying to me that LARK will keep flying. For all of us, especially new LARKs ready to fly, it is crucial to have the flock. C-EBLIP members and readers are invited to join the LARK mailing list, like us on Facebook, use our collection of resources on Diigo and write about their work for the blog. All links are available from the LARK blog. For more information about the LARK seminar “Holy Evidence! Research in information practice”, see program and this blog post. This entry was posted in Adjunct Member and tagged LARK, librarians as researchers, research network by vew908. Bookmark the permalink.